An incredibly soft and relaxed unisex hoodie, spun from a plush poly-cotton blend, will quickly become a go-to essential with a relaxed fit, hood with white drawstrings, full zip closure and ribbed cuffs and waistband. 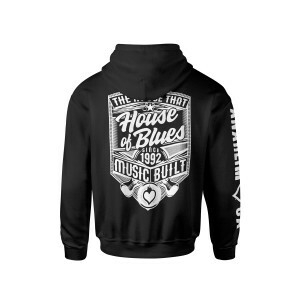 Featuring a modern yet traditional House of Blues graphic on the back and a city drop sleeve hit. 52% Airlume combed and ring-spun cotton, 48% poly fleece, 32 single 6.5 oz.